Don’t wait for the oil & gas company to provide you the service you need! Rowell’s Services can provide you the same coverage much quicker and we won’t focus on energy consumption, we’ll focus on what’s important to you! When you live in New Hampshire, you need a heating system you can count on to keep you and your family warm and toasty all winter long. 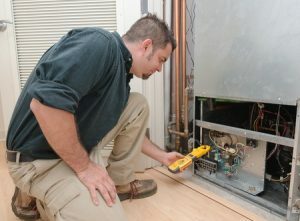 When something goes wrong with your furnace or boiler, you need someone you can depend on for expert heating repair. At Rowell’s Services, we can help. We provide heating repair services throughout the Northfield, New Hampshire area, and we are equipped to work on any type of heating system. Just like your car, heating systems need to be maintained in order to function properly. At Rowell’s Services, we recommend annual heating system maintenance to keep your heating system in prime condition. When you contact us, we’ll schedule a time to come out and carefully inspect the system and perform minor maintenance and repairs as needed to keep your heat running as it should. When you need heating repair in New Hampshire, we can help. When you call us, we will send an HVAC technician out as soon as possible to determine what’s causing your problem. We will let you know what we find, and we will work to you to figure out the solution that is best suited to your needs as well as your budget. At Rowell’s Service, we believe in providing our customers with honest, reliable service. Our technicians are highly trained, and you can depend on them to make sure you won’t be stuck in the cold during the winter months. We are available 24 hours a day, 7 days a week, and we respond to non-emergency calls as quickly as possible. To schedule an appointment, please call 603-934-4145.